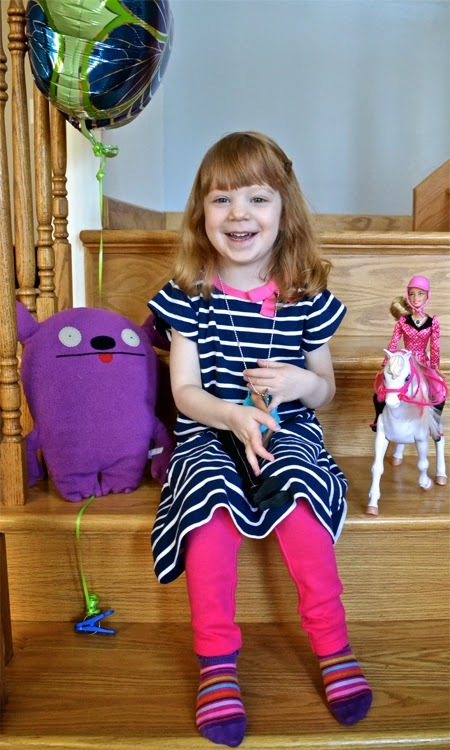 A Happy Song: She is Four. Jellybean just passed her fourth birthday. She basically had an entire four days of celebrating, which was a bit difficult for Buddy. (It is so hard to see someone else getting all of the attention and presents...) Jellybean had a blast and then fell to strep throat the very next day. At least she wasn't sick on her b-day. She started her weekend of fun off at the Natural History Museum with some of her cousins. 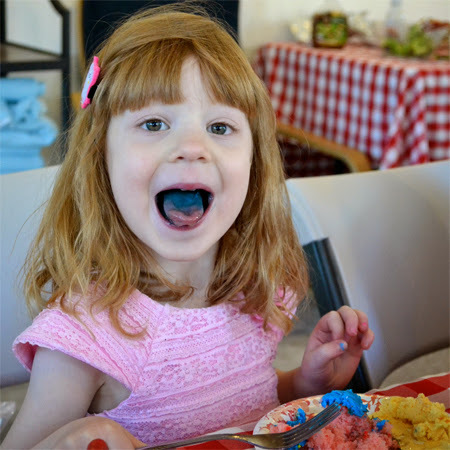 The next day, she got to eat her birthday cake at her grandma and grandpa B's house. 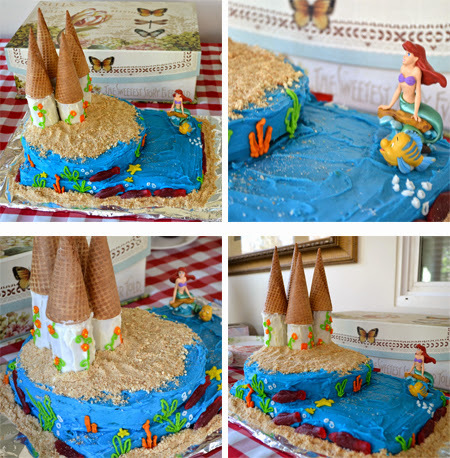 She had specially requested an Ariel cake with a castle. She helped me put the fish on. 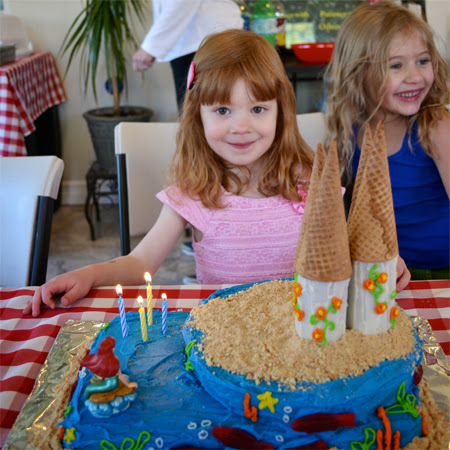 She loved the end result and if it doesn't end up on Cake Wrecks, I'll be happy. Monday, she received a special visit from her other set of grandparents. Then, on her actual birthday, she woke up to some presents. Later that day, we took a family trip out to buy books at DI and then to get cupcakes. Living the high life. 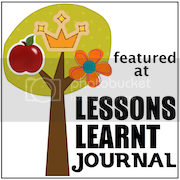 Jellybean is fun, loving, sweet and creative. She is always up for a craft or art project. 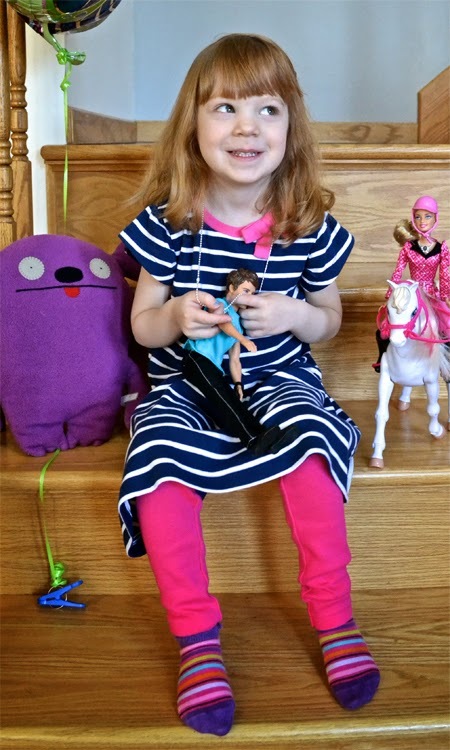 She loves, kittens, puppies, princesses, dress-ups, ponies, barbies, baby dolls and "mommy time." She enjoys being read to and has learned all of her capital letters. She is also well on her way to learning all of the lowercase letters and sounds. 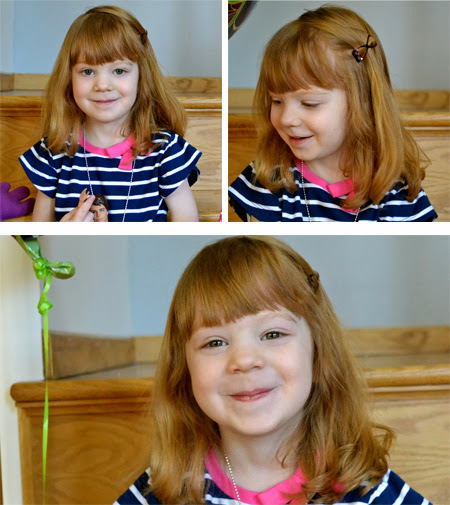 She will be starting preschool this fall and is very excited about it. This girl loves to play with both of her brothers. Teddy Bear loves her especially. She can always get him excited and laughing. It is so cute watching her play with him. Jellybean is my helper. She sometimes likes to play "helper bot" and is always up for helping me cook or get the table ready for dinner. She loves to listen to music and sing. She can often be heard belting out a number or two in her room. Right now, she loves to sing "Let it go," but can also be heard signing songs that she has just made up. Jellybean enjoys riding her bike and will likely be ready to take off her training wheels this summer. She always wants to play and really likes role play games. She is always happy to assign people roles, not so happy if they deviate from their assignments. If you ask her where she'd like to eat out, she'll most likely say Wendy's. If you ask her what color her hair is, she'll say orange. Which is still her favorite color as well. She always has a secret for you and will not let you leave without a hug. Jellybean started ballet this year and D and I are so impressed by her focus in class. It is clear that she loves to dance. Jellybean loves to spend time outside, even just exploring the backyard. She also is a great helper in the garden, an excellent rescuer of worms and she can't wait to help me with a vegetable patch this summer. We could not be prouder of her. She is such a bright, sunny girl. I am so glad that she's mine. Here's to another year of awesome. I am very impressed with your cake! I'm almost dreading the special cake requests from my kids when they get older because I have absolutely not talent in that area. Give Jellybean a hug from me! Miss her!